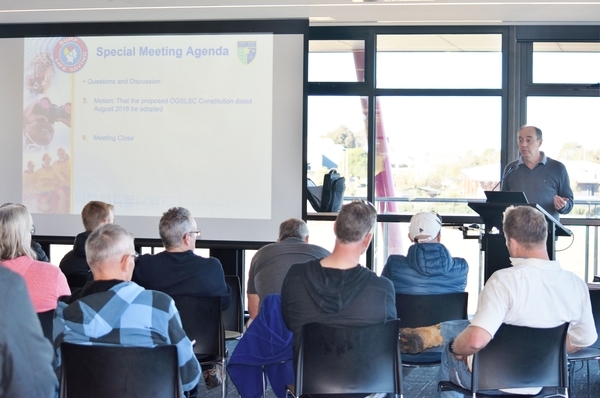 Ocean Grove SLSC president David Pavia addresses members at the club''s AGM this month. Ocean Grove Surf Life Saving Club held its annual general meeting this month and revealed more funding was needed to have its new Surf Beach Complex furnished. The AGM was shifted to the Shell Road sports pavilion on Sunday 5 August to accommodate the surf club’s multi-million dollar building re-development. Ocean Grove SLSC president David Pavia said while the building is fully funded, the club had sought grants from the public sector and private business to help furnish the re-development. “We have sufficient funds to build the building, but we don’t have enough to furnish it entirely,” Pavia said. “We have been seeking grants from both the public and private sector and will continue to do so, to fund the equipping of the building. 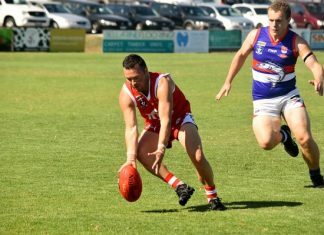 The federal government contributed $1 million towards the club’s building re-development, while state government has allocated over $4 million, including construction towards a new patrol tower. Pavia said the patrol tower should be ready for the start of 2018/19 patrols and was hopeful the club building would be finished in early 2019. “My understanding is that the plan is to have the tower operational for this season with the rest of the building completed early next year,” he said. Prior to start of AGM a special meeting was held which adopted an updated Ocean Grove SLSC constitution. “The new constitution aligns with current legislation for incorporated bodies such as ours,” Pavia said. “It aligns with Life Saving Victoria and Surf Life Saving Association’s grievance procedures and the recent safeguarding of children legislation enacted by the government. “With the new clubrooms on the horizon, it is timely that we refine our strategy and celebrate the success of the club across all ages and disciplines,” Ocean Grove SLSC vice president Stephanie Asher said. IN other developments, several new personnel have joined the Ocean Grove SLSC Committee of Management for 2018/19. Donna Greeves was appointed as Competition Manager, Ros Williamson takes on Sponsorship and Fundraising and Simone White is the new Social and Lounge Manager. Chris Paterson re-joins the committee as a General Member, while Steve Peatling is the Facilities Manager. David Pavia retains his role as Ocean Grove SLSC President for a third term. MEANTIME Ocean Grove SLSC’s biggest annual fund-raiser this summer’s Rip to River Classic will be held on Saturday 29 December, while the third Ocean Grove SLSC Ocean Open Water Swim Festival is on Sunday 27 January, 2019. Next articleGrove straight through to decider.